Serial to Composite Analog to SDI Converter. The D10C SDI to Analog Converter provides excellent quality 10-bit digital to analog conversion at low cost. The D10C is useful for D/A conversion, high quality monitoring, or adding an SDI input to VTRs, worlstations, or other analog video equipment. The D10C automatically works with component or composite SDI inputs in 625 or 525 line formats. 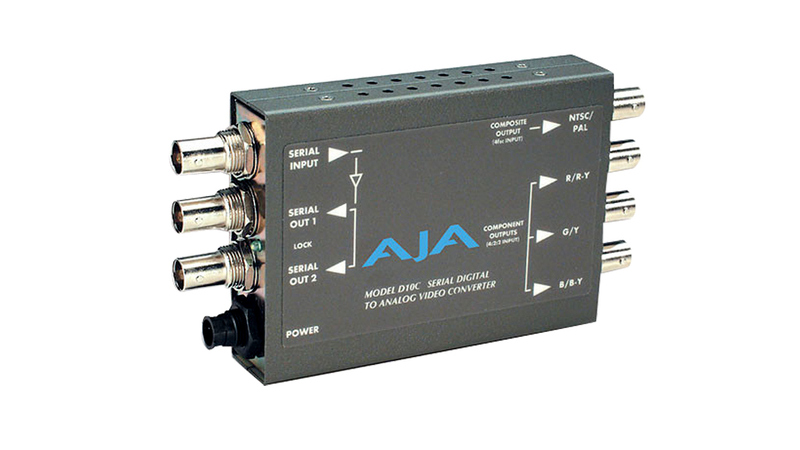 It features one SDI input with two re-clocked, loop-through SDI outputs. The D10C also acts as a distribution amplifier/repeater. The D10C provides a component analog output for component SDI inputs (D1), a NTSC output for 525 line composite SDI inputs (D2,D3), and a PAL output for 625 line composite SDI inputs (D2,D3).